Philadelphia has been the backdrop for many key moments in American history and is thus home to a lot of monuments and markers. 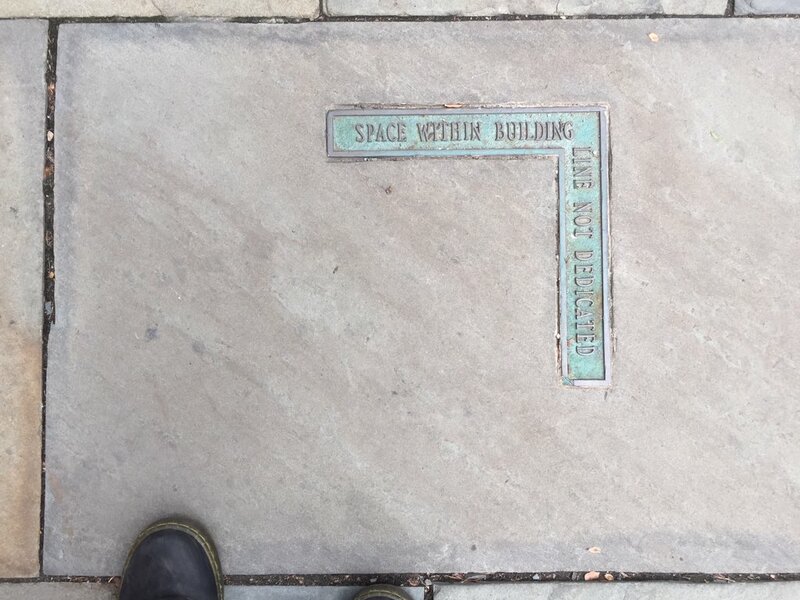 Amidst the many statues standing in squares and signs affixed to architecture, though, it can be easy to miss a series of smaller plaques embedded in sidewalks, reading like strangely spatial one-line poems. 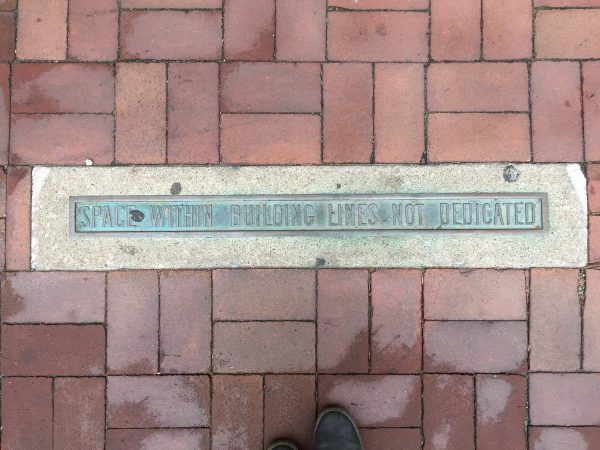 “Space within building lines not dedicated” reads one. “Property behind this plaque not dedicated” says another. Dedicating, in a legal sense, means giving over (e.g. to the public). The wording varies somewhat, but the basic message is the same: you’re welcome to walk here for now, but (just so you know) this is actually private property. There are linear plaques (together forming dashed lines along owned edges) as well as right-angled ones (denoting the corners of properties). 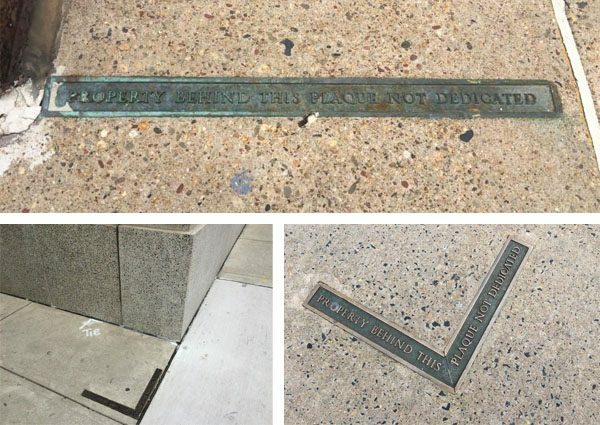 “The plaques are used when the property lines don’t align with the building’s physical dimensions,” explains Jim Saksa of PlanPhilly, “or the dimensions of any sort of fencing, landscaping or other improvements that would clearly mark a boundary between the public right-of-way and private property. In these situations, the property line falls somewhere in the middle of the sidewalk.” By allowing part of their property to become a walkway (at least for now), the land owner is granting an easement while reserving the right to build out later. Easements are ways for owners to allow limited uses of their land — like a path through a plot of land to access a public park or an agreement with a neighbor to share part of a driveway. Easement laws vary by location, but a lot of them allow for different forms of adverse possession (which is nine tenths of the law, as the saying goes). Per Saksa, if a property owner lets someone else use their land “blatantly, consistently and exclusively for a long, statutorily set amount of time—21 years in Pennsylvania—then they own it.” In the case of these prescriptive easements: if private owners fail to explicitly mark out their territory, someone could eventually argue they have forfeited ownership. Hence these markers, which make sure the public knows where the line is drawn, just in case it becomes an issue in the future. We have similar markers on the pavement here in the UK.